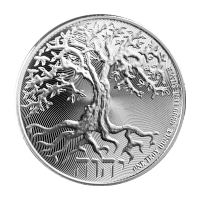 1 oz 2018 Niue Tree of Life Silver Coin | ?? 正面 An almond tree in blossom with the Hebrew script for Yahweh. 反面 Effigy of Queen Elizabeth II and the words "Elizabeth II Niue Two Dollars"